All transactions are safe and secure with a reliable history in online purchasing behind each of our associates. Buy the Pulp Fiction Ezekiel Quote t-shirt to own Pulp Fiction clothing and merchandise. The front of this Ezekiel t-shirt features the familiar Pulp Fiction Bible verse from Ezekiel 25:17. Jules recites the Bible quote right before he shoots Brett (Frank Whaley) for his disloyalty to Marsellus. The Ezekiel Pulp Fiction quote ends with the lines, "And I will strike down upon thee with great vengeance and furious anger those who attempt to poison and destroy my brothers. And you will know my name is the Lord when I lay my vengeance upon thee!" 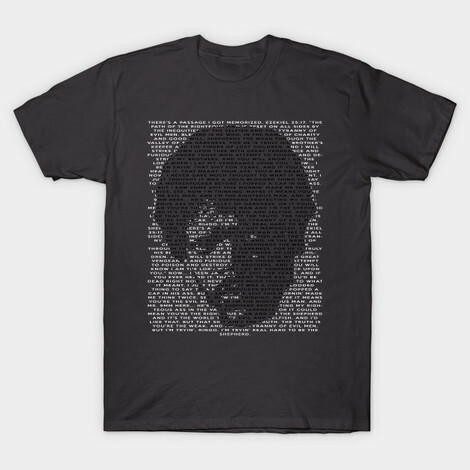 In addition to the Pulp Fiction Ezekiel Quote tee above, browse the Pulp Fiction Clothing Gallery for more apparel like men's and women's clothes, kids shirts or hoodies.